sharing is caring! we do appreciate your time to let others know us! Looking for tax invoice software? 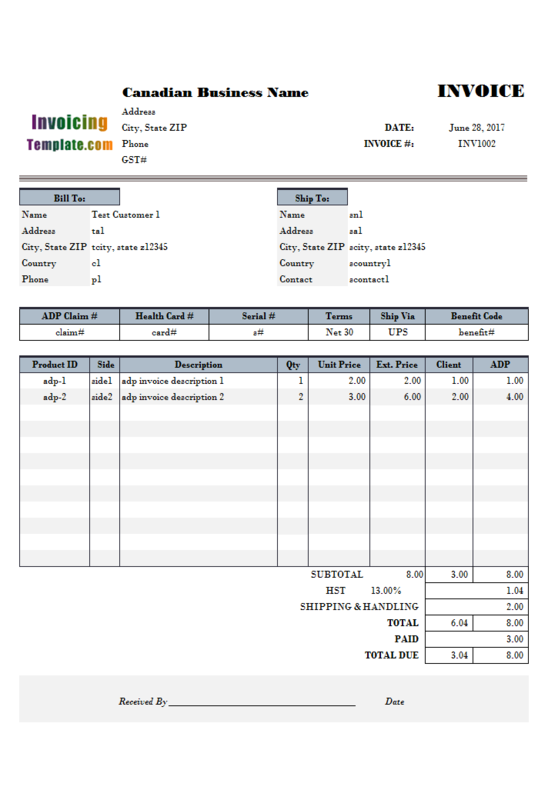 Here you can find sample tax invoice templates created for specific countries and regions. Each section includes several customized invoicing forms, and also related official / useful links to resources related to invoicing requirements and taxing rules. 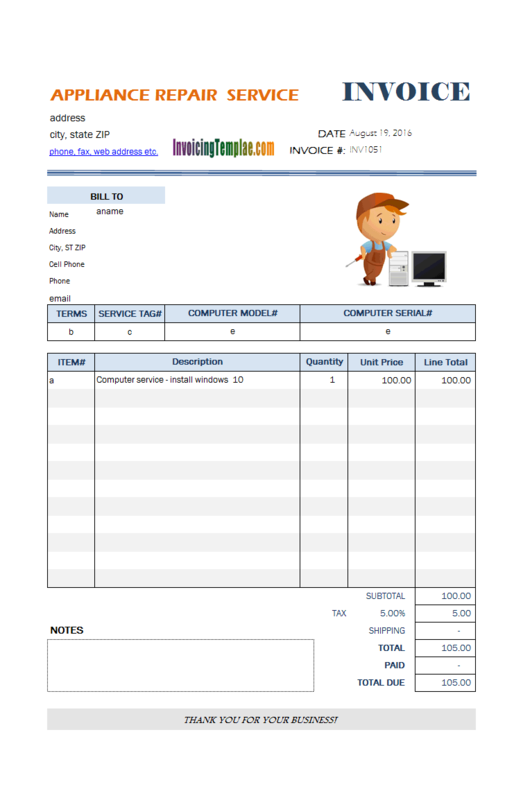 Note that most templates here on InvoicingTemplate.com are not country or region specific. To find more invoice formats that meets your business requirements, use the search tool. 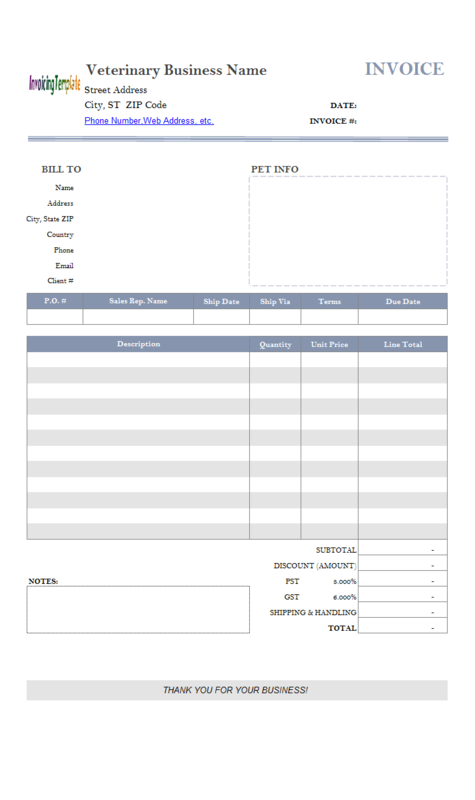 Note For templates specific to VAT, visit VAT invoice templates. What information must a tax invoice show? Special types of tax invoices. 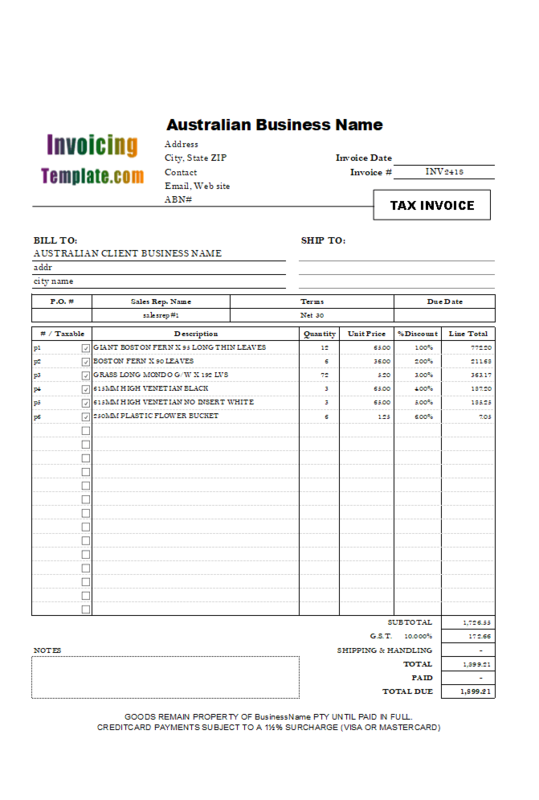 Here are our templates closely related to Tax Invoice Templates for 11 Countries. 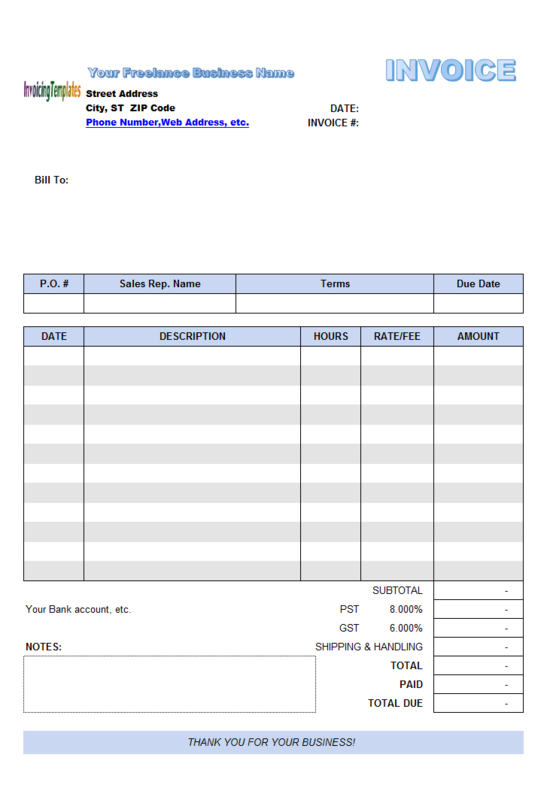 Australian GST Invoice Template is a sample of customization of the default sales invoice template. 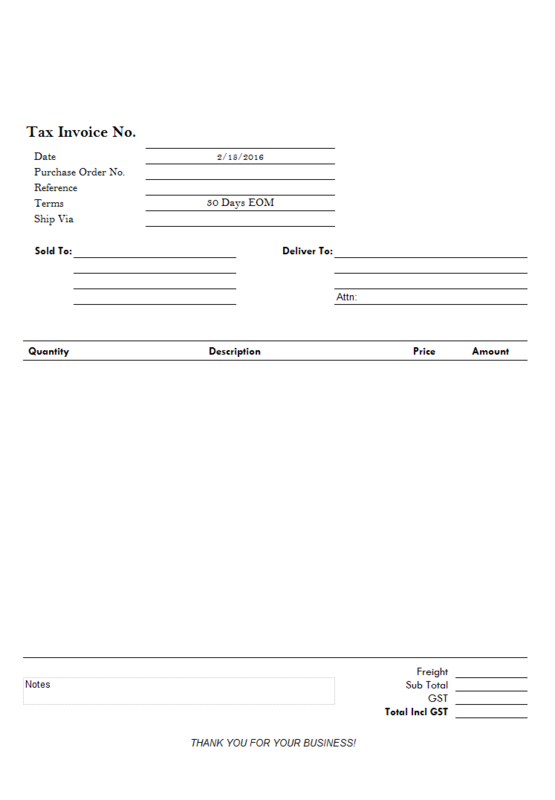 Australian GST Invoice Template implements the invoice layout and form according to Australian Government / Australian Taxation Office requirements. 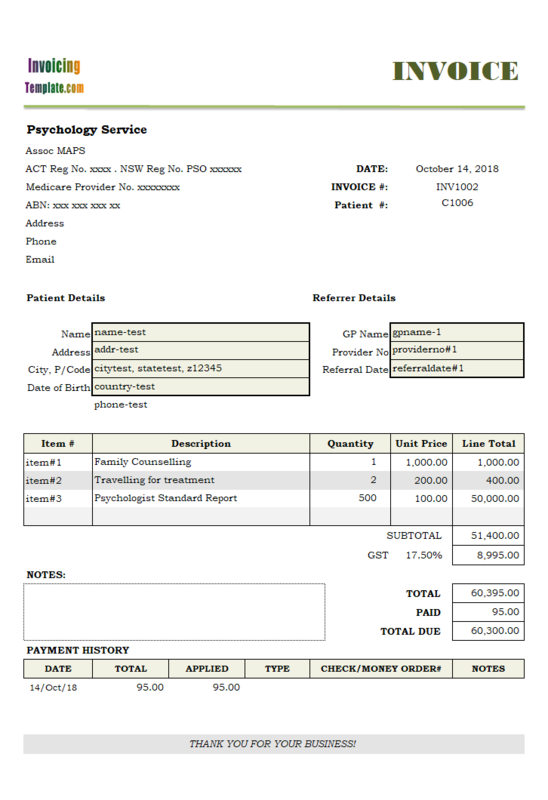 The default invoice template does allow you to choose tax-type with 3 options: no-tax, one tax and two taxes, but this option is applied to all the items on the invoice form. 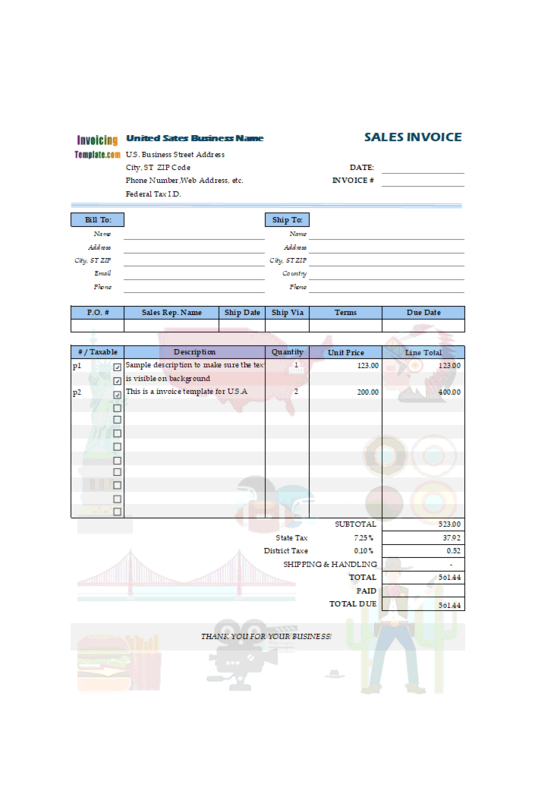 This slightly-customized invoice template differs from the default invoice template in that it allows you, on the single invoice form, to have some products with no tax, some products with one tax (such as GST) and some products with two (such as GST and PST). An additional block was added to the bottom of the form, next to the grand total field. There are 5 fields inside the block, i.e. "PRICE BASIS", "ETA VESSEL","EST. DELIVERY", "CONTAINER #" and "SEAL#". Most of them are custom fields too, except the "EST. DELIVERY" field which is the "ShipDate" field in the standard database definition. 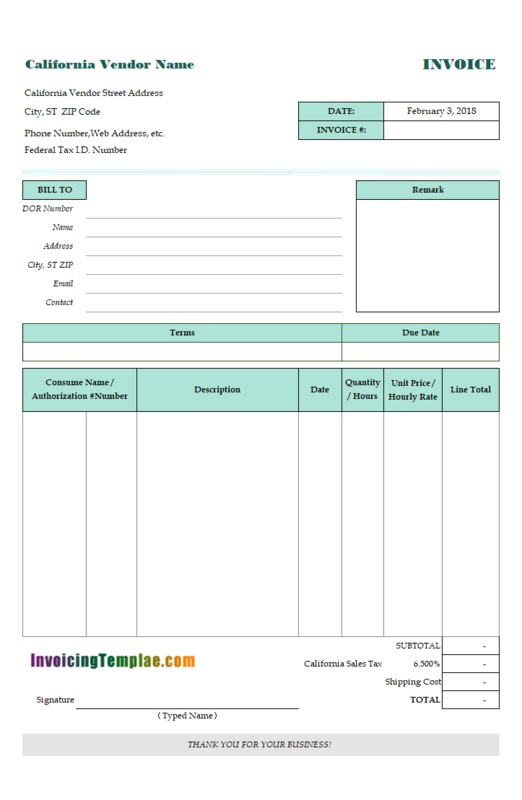 On the vendor information section on top of the form, note a line of "Federal Tax I.D. Number" is added. This could be FEIN or SS#. In the "Bill To" section, we reuse the original "Client#" and titled it with "DOR Number". If you have both customer# and DOR authorization number to be included on your invoices, simply add a custom field for the DOR number to the "Invoice Header" database table. 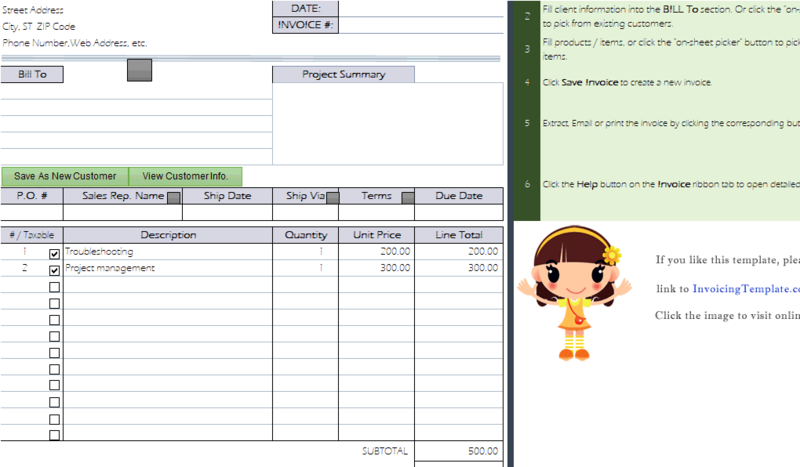 See How to add custom fields to "Invoice Header" database table for detailed tutorials. 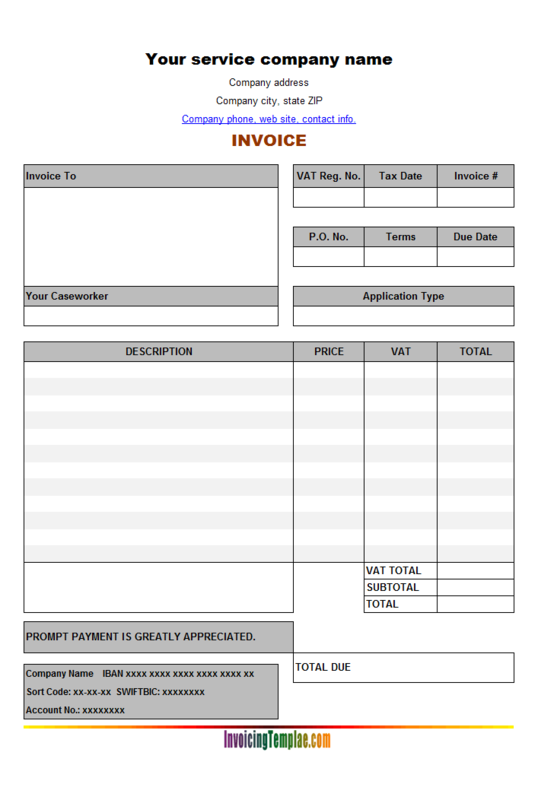 The VAT invoice template has a special VAT Rate column placed outside of the printable VAT invoice form (See more customizations on printing at printable invoice template). This column allows you to adjust the VAT rate for each item that is being sold. Since it is placed outside of the printable VAT invoice form, it will not be included on the printed copy of your VAT invoices. How do I add custom field to Invoice Body table? How do I map a database field to an Excel cell or range? 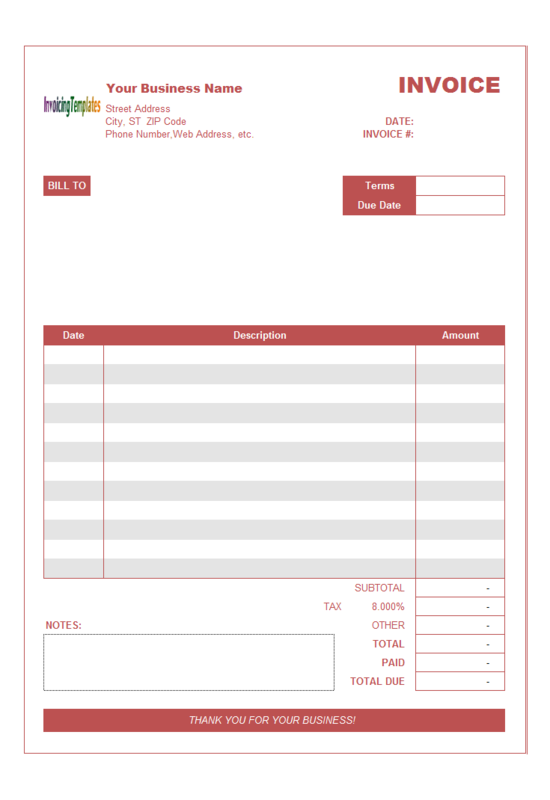 This simple invoice template is suitable for printing on papers with letterhead. 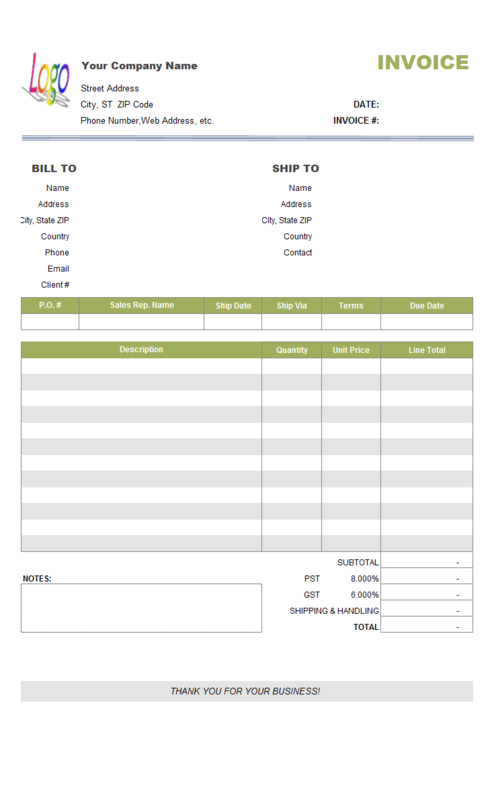 It contains both a "Bill To" and a "Ship To" sections, categorized as sales invoice template. The 4 columns on the detail section are Quantity, Description, Price and Amount. 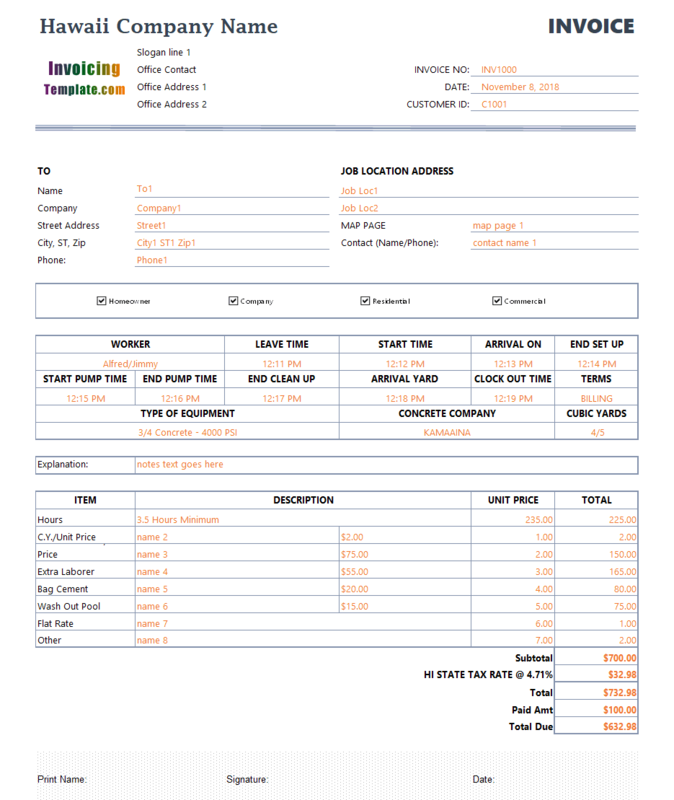 The form includes 5 generic columns on the detail section, including "Item#", "Description", "Quantity", "Unit Price", and "Line Total". The price here does not include tax. The tax named "GST" will be calculated using the special "GST" cell. 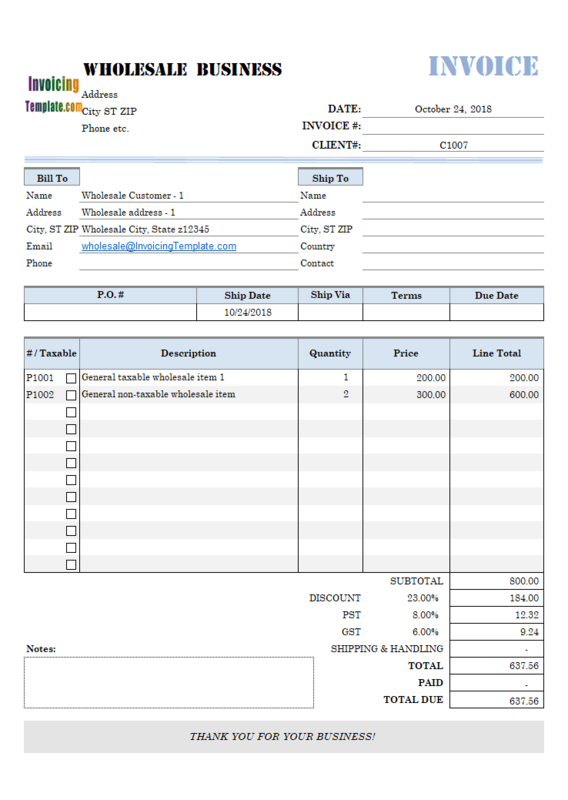 Refer to c7018 Australian GST Invoice Template and c7019 Australian GST Invoice Template (2) for more information on this topic. The default tax rate on template is 17.5%. To set the tax name and rate, click the "Settings" button on the "Invoice" ribbon tab, and then go to the "Taxes" tab, where you can find options for the number of taxes, tax names, rates etc. This template has 8 columns. They are "Product ID", "Location" (where the warehouse is, for example), "ATA", "Status", "Description", "QTY", "Unit Price" and "Line total". 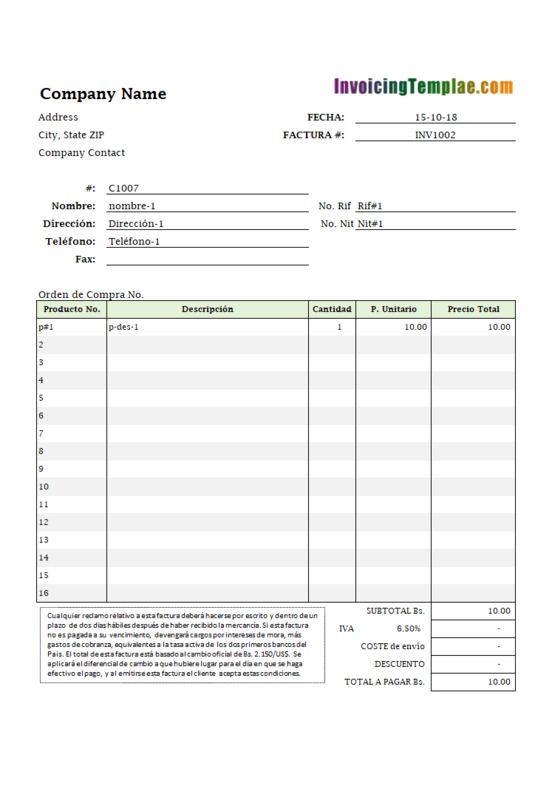 The purpose of the sample data shown on the figure is for testing the template. 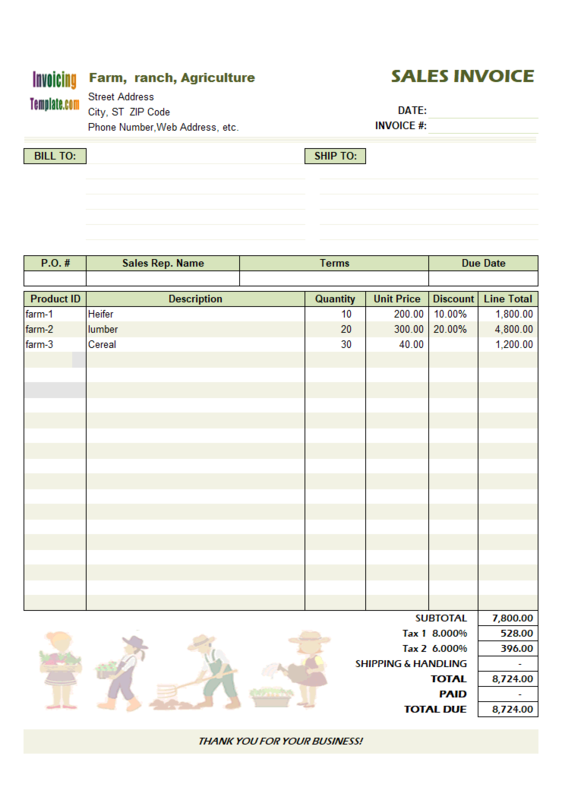 The detail section expands to two pages (see our multiple-page invoice templates) and offers 42 lines in total. 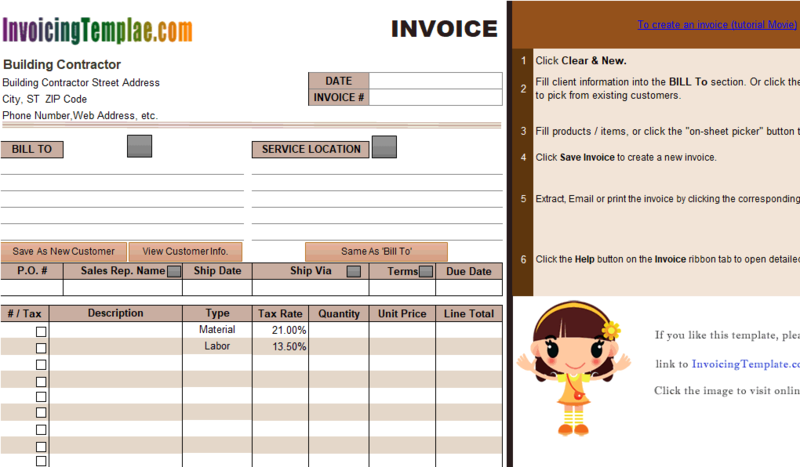 Push down the "Design Mode" button on the "Invoice" ribbon tab. Click the text you want to modify. Once done, exit design mode. Next to the "To" (usually "Bill To" on the other templates here on InvoicingTemplate.com), there are fields for two lines of "Job Location Address". The address consists of two lines, both are custom fields. Next to that, there are fields for "Map Page" and "Contact Name / Phone". 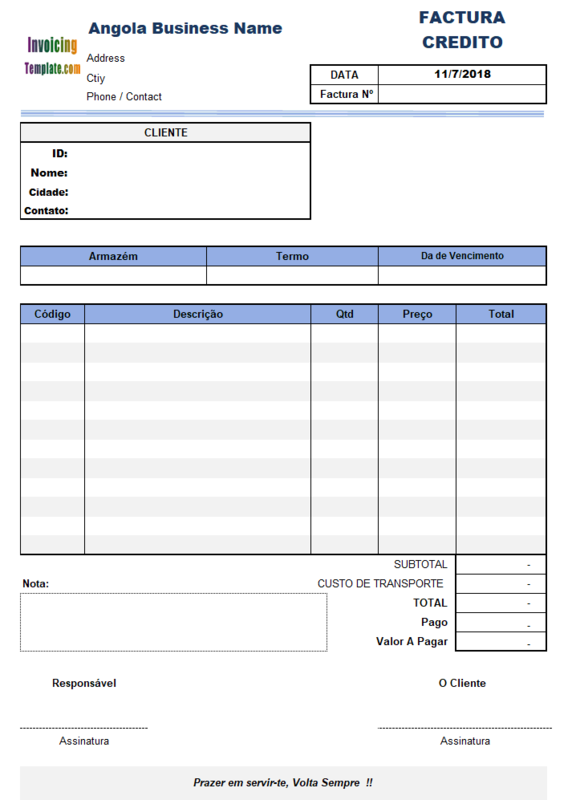 This credit invoice template for Angola has all the text labels translated to Portuguese. 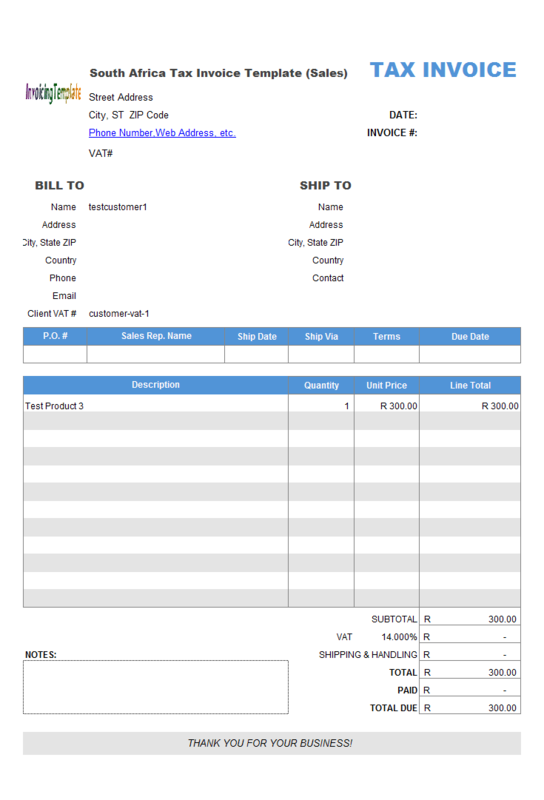 It is a service invoice template that does not include shipping address fields. 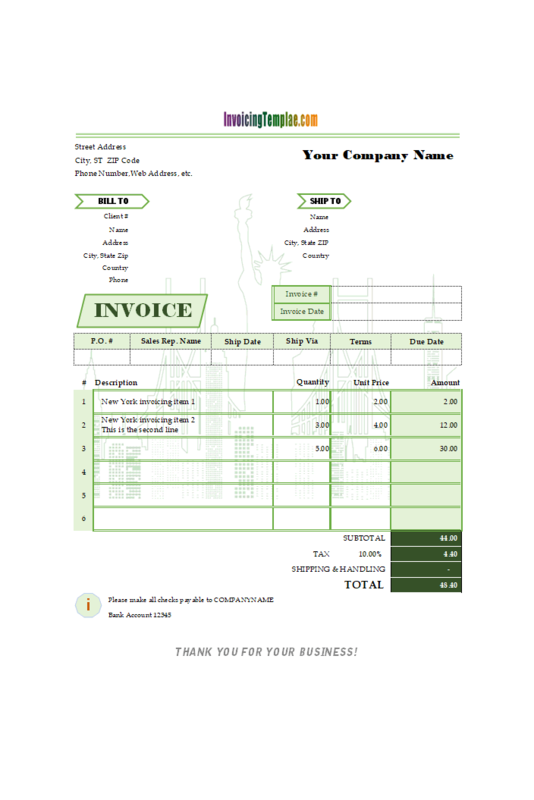 This is a free lightweight / simple blank sales invoice template for Australia. 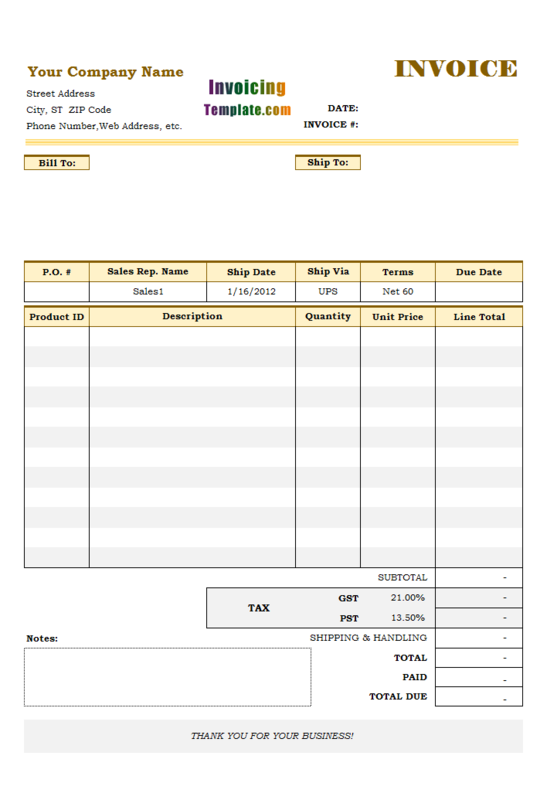 It includes fields for ABN#, as well as a discount column. It does not contains many colored blocks, and thus looks clean, simple and lightweight. 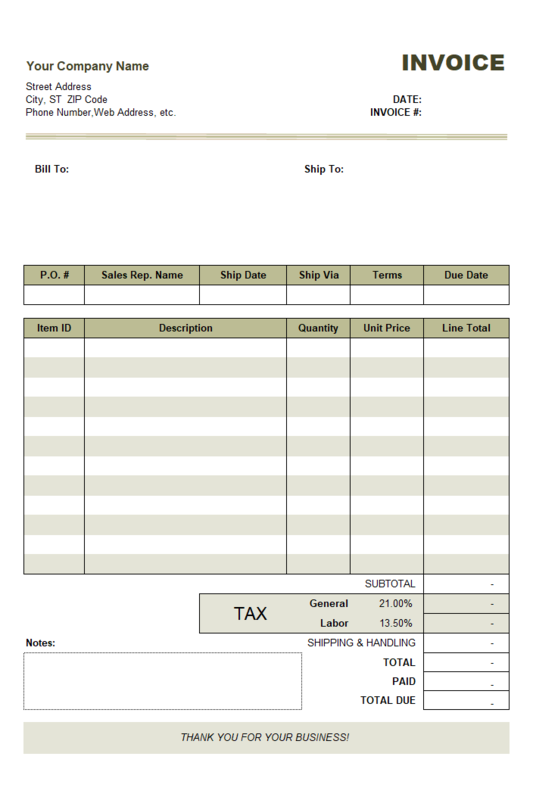 The template also offers a "Taxable" checkbox column, which is placed outside of the printable area. In Excel sheet, the "Print_Area" range name defines what content to print when you execute the "Print" command. You can move the "Taxable" column into the printable area, i.e. 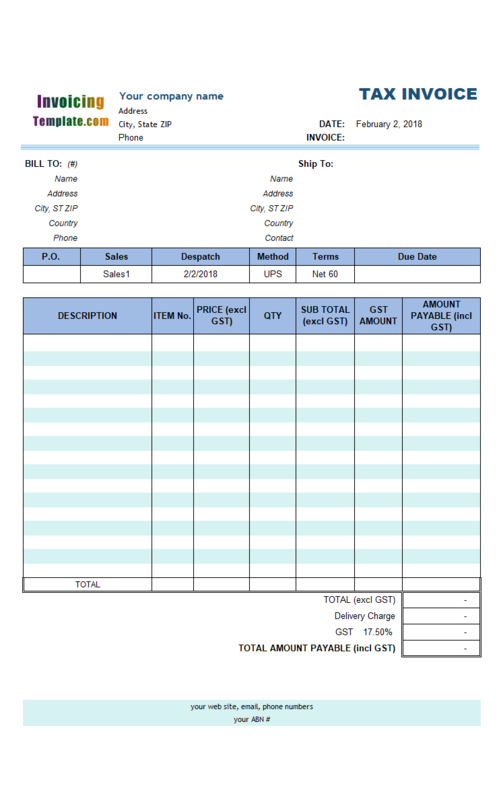 the main area on the center of the "Invoice" sheet, by following the steps described on customizing invoice template - moving cells and controls. 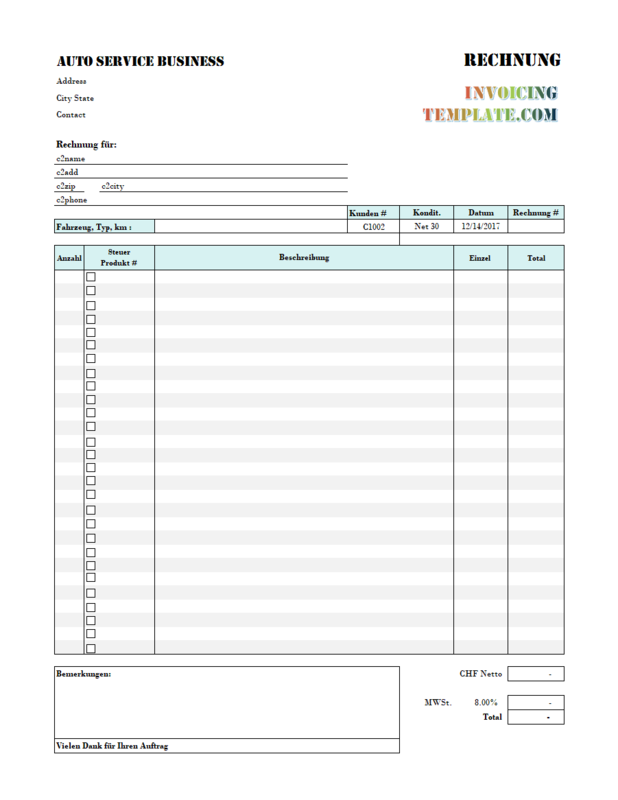 This template is customized based on c5038 Sample Sales Invoice Template: Using Handwriting Signature. 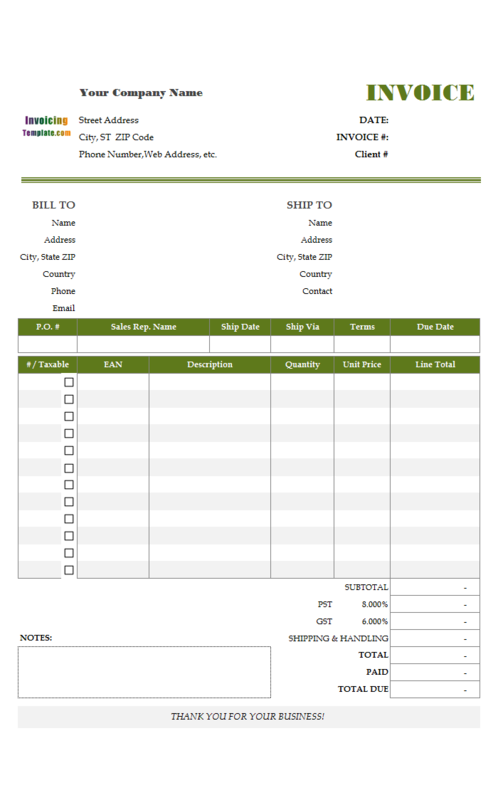 The c5038 template is a sample that shows you how to add a handwriting signature image to the Excel sheet, so that the additional signature is included on both the printed invoice and PDF invoice generated by Invoice Manager for Excel (namely Uniform Invoice Software) (UIS). 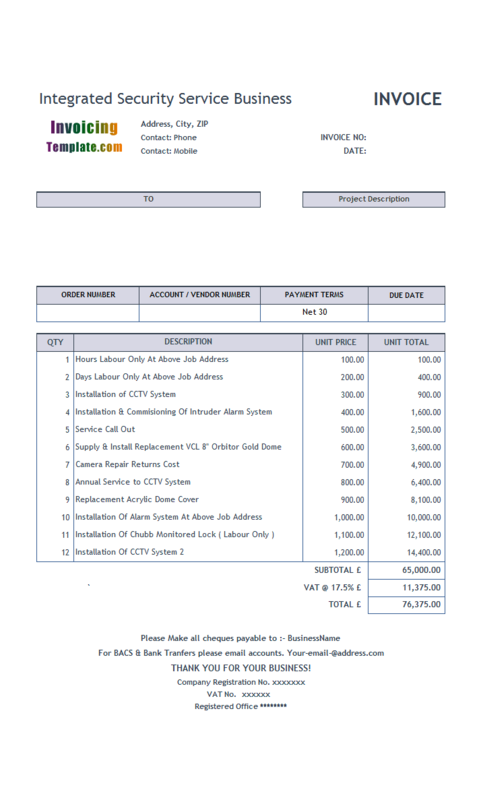 This building contractor invoice template is decorated with an image on the form. 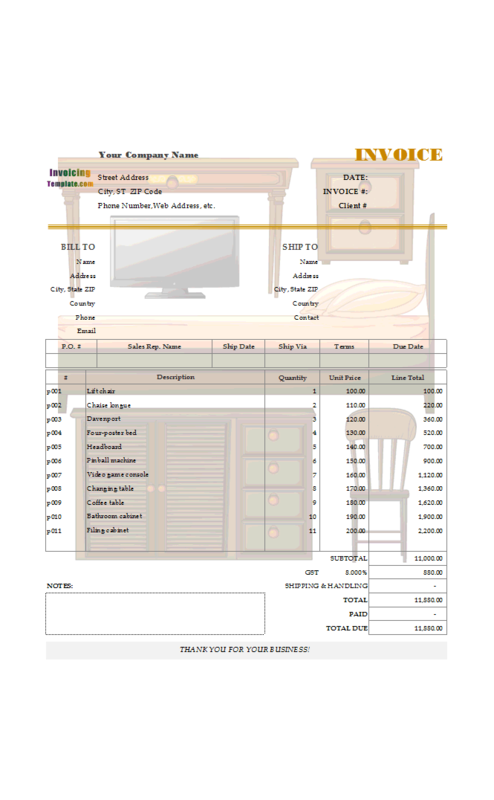 The image shows a 3D puppet building a house, which is printable, and is included on PDF invoices too. Try this free template if you are a civil contractor in the construction industry. 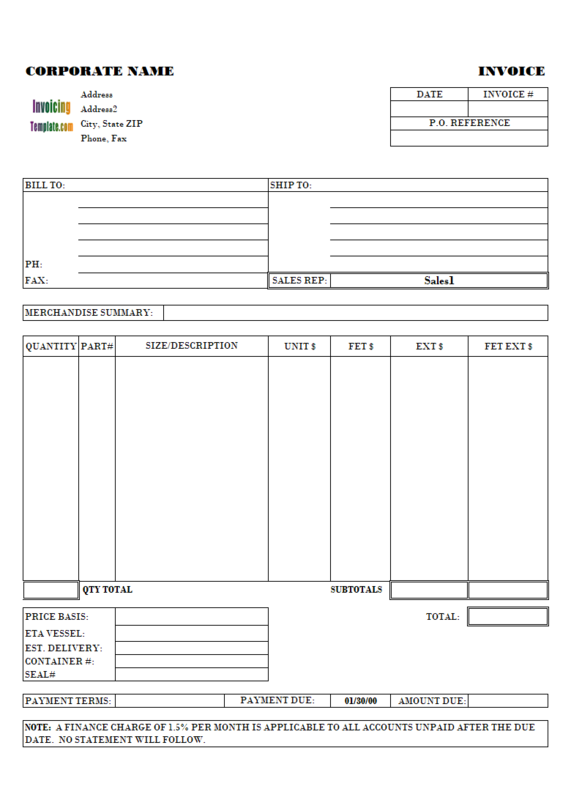 This template uses a horizontal "InvoicingTemplate.com" logo placeholder on the top of the form. Underneath that is your own company information. Be sure to list your Taxpayer Identification Number (TIN) if applicable, in addition to your business name, address and contact details. Copyright © 2013-2018 Uniform Software Ltd. All Rights Reserved.